Come with us and experience the taste of the heartland. Is this Heaven? No, it’s Blue Valley. Blue Valley fish are selected from the best of stock, farm-raised in Nebraska’s clean water, with nutritious feeds containing no antibiotics or unhealthy feed additives. Donaldson Steelhead Trout is high in Omega-3 unsaturated fats, which have been proven to lower blood triglycerides and cholesterol levels, reduce the risk of heart disease, reduce blood pressure, and relieve the pain of rheumatoid arthritis. Trout is also naturally low in sodium and calories, plus it’s an excellent source of protein. Blue Valley Aquaculture’s Steelhead trout are hand filleted with pin bones removed, then vacuum-packaged for freshness and extended shelf life. 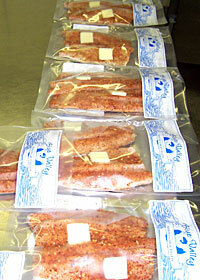 The fillets are then flash frozen for supreme freshness and quality that can only be found at Blue Valley Aquaculture. Natural Fillets: Fresh from our coldwater flow through system our firm flesh natural Steelhead trout are enhanced with a delicate and mild flavor that can only be found at Blue Valley. Country Style Breaded Fillets: Our original natural Steelhead trout hand-breaded country style, for a traditional Nebraska comfort food. Ruby Red Fillets: Our same firm flesh steelhead trout with a ruby red hue, resulting from a special carotene-rich diet. Southern Blend Fillets: A unique pairing of Cajun spices and rosemary give our Steelhead trout a southern flair that will tickle your taste buds. Italian Fillets: A classic blend of Italian seasonings incorporating red bell peppers and onion to progress your favorite Italian dishes. Lemon Herb Fillets: A traditional lemon herb intermingles with garlic, onion, and black pepper to reinvent the classic lemon flavor experience. Roasted Garlic Fillets: Robust roasted garlic integrates with red and green peppers, onion and a hint of chili peppers to deliver this one of a kind flavor. Lime Pepper Fillets: A refreshing fusion of fresh lime and bold black pepper meets onion, garlic and parsley to give you a flavor straight from the keys. Citrus Fillets: A balance of tart lemon peel, dill, and garlic will bring an invigorating flavor that your pallet won’t soon forget. Blue Valley Aquaculture’s Steelhead fillets can be prepared with a variety of techniques resulting in many unique flavor opportunities for you to enjoy. Our freshly frozen products are ready for the preferred cooking method, each with its own pat of butter and seasonings. Our fillets can go from the freezer to the grill, oven, broiler, or frying pan in a matter of seconds. Not the easiest way, the best way: No force-feeding, no speed growth, no overstocking. It’s the way they’ve always done it at Blue Valley and it’s why the heart-healthy, farm fresh taste comes shining through with each and every serving. 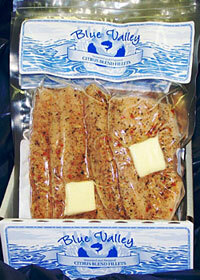 Blue Valley fresh water Steelhead trout fillets, a healthy diet never tasted this good!